When a film becomes adapted into a spin-off video game to make a quick buck the gaming community silently sheds a tear. On the other hand, when a video game becomes adapted into a movie we all assume the fetal position rocking softly back and forth muttering about how Resident Evil made more sense as a game… Oh wait. But fear not, our anticipation for Ubisoft’s upcoming film adaptation of the award winning Assassin’s Creed series might not just be blind hope, there is a shining light at the end of this dark, twisted tunnel of video game film’s… And it’s name is Michael Fassbender. 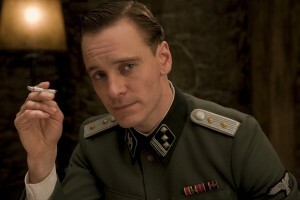 According to Ubisoft Motion Pictures’ CEO Jean-Julien Baronnet, Fassbender was the studio’s first choice for the lead role, and with ever increasing popularity after stellar appearances in Inglorious Basterds, X-Men: First Class and most recently Promethus, it’s easy to see why he’s been cast for the iconic Assassin. Which Assassin he will be playing however is currently unknown, as the franchise now sports three hooded heroes in Altair, Ezio, and now Connor; although if Ubisoft Motion Pictures intend to provide gaming films with any credibility whatsoever we should see Fassbender begin his career in accordance with the chronology of the story, playing the roles of Assassin #1 Altair as well as Animus puppet master Desmond. Yet if history has shown us anything it’s not safe to rely on an actor to make a film good, Ubisoft proved only two years ago that Prince of Persia wasn’t ever going to be good no matter how much Jake Gyllenhaal they tried to stuff in it. Yet again it seems the series is in safe hands with Fassbender‘s own production company DMC Film behind the scenes alongside Regency Enterprises who’ve brought you such quality films as Fight Club, Mr. & Mrs. Smith, and Big Momma’s Hou-… mainly those other two. So far this is all we know about Ubisoft’s film adaptation of Assassin’s Creed, and until a trailer comes out we can do nothing but hope. In saying that, if ‘nothing is true, everything is permitted’… Does that mean it’s possible for a video game movie to be… *Breath* Good? Until we know for sure, I’m just going to shamelessly plug my review of Assassin’s Creed 3, which you can check out here!